I wanted to post about Berlin once we were settled in Amsterdam, but once again, shanty internet has plagued me. Luckily our internet now in Paris works like a charm! Woo!!!! I would live in Berlin. Let’s just throw that out there now. There’s just something about it that’s very calming, even though it is a major city. No one is in a rush! Yes, there are bicycles everywhere, but it’s not a crazy atmosphere of people trying to get around. The people were friendly, a ton spoke pretty perfect English, and all were willing to help. Our hotel in Berlin was great. Very hip, modern and had a great staff that immediately made us feel at home, and were extremely helpful! Great to see from a hotel that’s barely been open a year! We started off our first full day in the city by hopping on a bike tour! I cannot recommend Fat Tire Bike Tours enough. They were fantastic. Our tour guide was fantastic. And I discovered my love for a cruiser style bike, rather than a mountain bike. Looks like I might be making a trade when I get home! 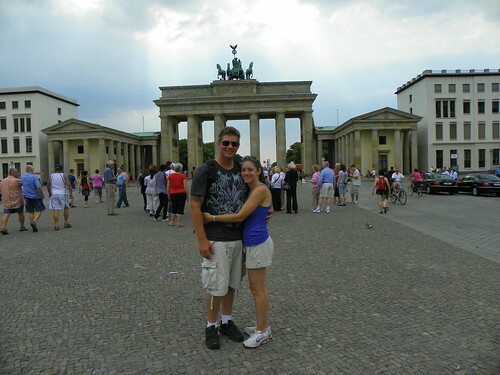 The tour took us all around Berlin, and we biked back and forth between the West and East sides. 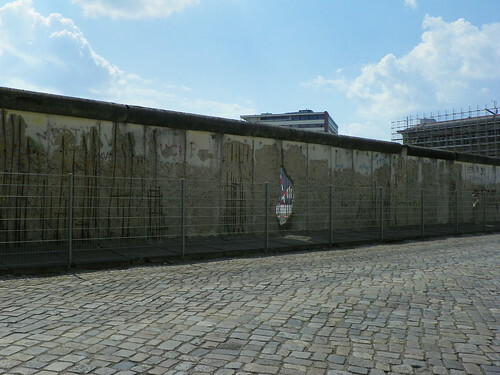 Amazing to think that less than 30 years ago the Berlin wall was still standing, and being able to hop back and forth across the city like that was impossible. 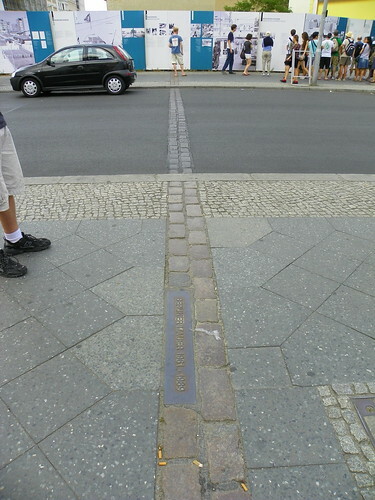 This line runs all across Berlin to mark where the wall once stood. If you’re standing on the side facing the plaque, you were on the West side, (the free side). 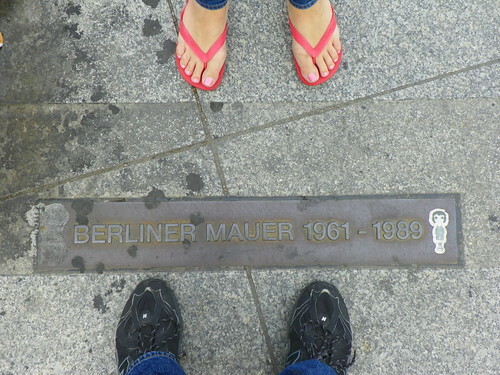 Standing with the plaque upside down to you, meant you were standing on the East Side, the Communist side. That night Dave and I decided to get some authentic German food, and Lonely Planet (our guide throughout this whole trip!) recommended Schwarzwaldstuben, which was local to where we were staying. It was great! 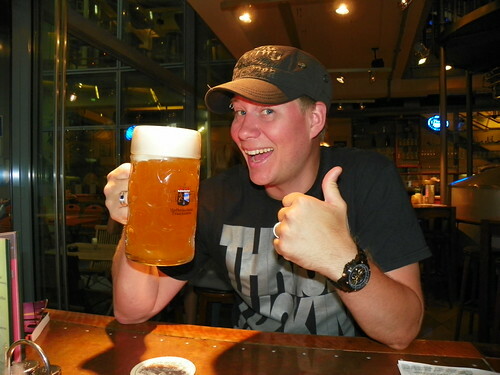 We had delicious beer, and great cuisine. I had the geschmelzte maultaschen, which could basically be summed up as a cross between a ravioli and a pierogi (kind of). Regardless, it was delicious! We did a lot of walking around during our other full day in Berlin, went to the Pergamon Museum, ate some curry wurst, explored a lot, and then watched some of the Netherlands vs Uruguay semi final World Cup match! 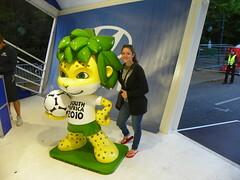 Me hanging out with the 2010 World Cup mascot (his name is Zakumi, in case you were curious), and one of the many screens in the Berlin FIFA Fan Park. The architecture of Berlin was so vastly different than Prague, or even than London! I had to keep reminding myself that the reason everything looked so new, and that there really weren’t any “old” buildings was because of how ruined the city was between both World War II, and the Cold War. They had so much to rebuild! When you take all that into consideration, it’s really amazing how far the city has come in the short time it’s been given. Also, something that struck me was a quote our bike tour guide told us, which of course I can’t remember the exact wording of, but basically it was that although many, MANY Germans would would like to completely forget about all the atrocities that occurred within their country during the 20th Century, they have adopted the idea that they must live with the past, no matter how sordid, and only look to the future. 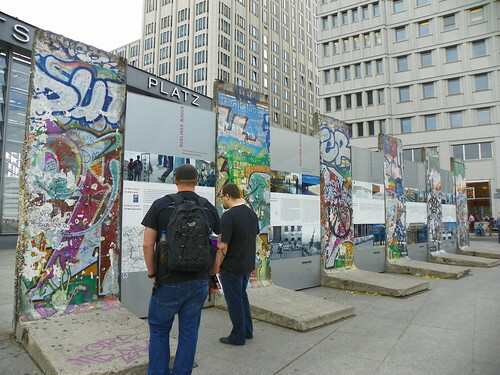 I definitely saw this in all of the monuments to the Berlin Wall, and all of the monuments and memorials dedicated to the Jews that were persecuted during WWII. They were all over the place. 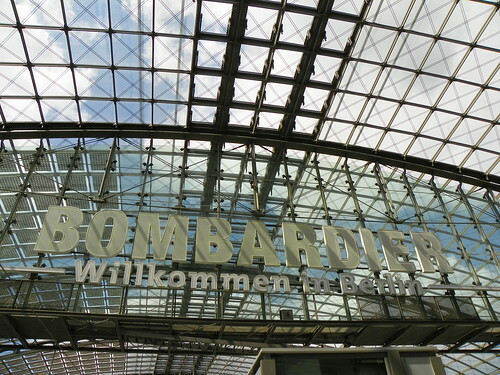 I was sad to leave Berlin, but so excited to get to Amsterdam!! 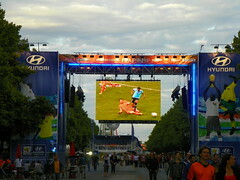 Here are some more pictures from Berlin! 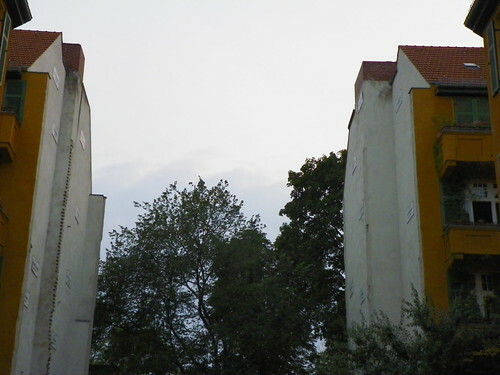 An art installation of the wall – from the western side. I'm so glad you guys are going to all these different cities instead of just sticking to one place! Sounds like you're having a blast. YAY! Can we relocate the BXUG to Germany? I can translate everything. 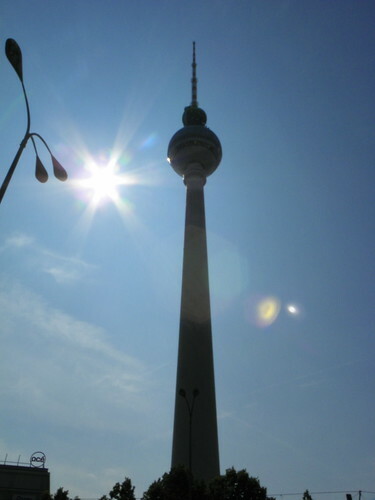 I love Berlin! 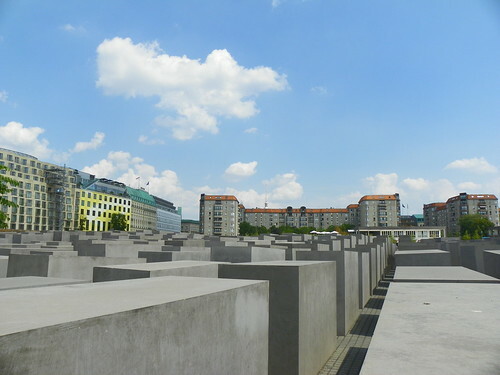 Berlin is on my "must see" list! I just saw a movie not that long ago about the wall and the group who built a tunnel underneath. It was crazy and heart-wrenching knowing it was based on a true story. If I can think of the name I'll forward it to you. Wow! Look at you! This looks like a good trip. I hope you're having a good time! The geschmelzte maultaschen looks incredible. Berlin looks great! Really looking forward to visiting later this year.. remind me to pick your brains when I get home about MUST SEES!